Successfully Added Hi-Def Home Digital Multimedia Center (SATA HDD Player) to your Shopping Cart. Hi-Def Home Digital Multimedia Center - SATA HDD Player. Introducing one of the finest Hard-disk based media centers. A multimedia center that lets you enjoy all your favorite videos, movies, music and family photos at home on your TV or home-theater projector. This elegant 3.5 inch SATA HDD (hard disk drive) multimedia player is also the perfect way for viewing and recording high quality digital media files with your TV. Based on the twin functionality of a Hard-Drive Enclosure and a Multimedia Player, this elegant 3.5 inch SATA HDD (hard disk drive) multimedia player comes supplied with system media software and multiple connection types for easy connectivity. You can effortlessly connect to your PC or DVD player, and even use digital AV devices via the 2 front side USB ports. Designed with your convenience in mind, this user-friendly multimedia player and remote control gives you total control of your digital media library with a streamlined user interface. Using this powerful multimedia center is simplicity itself. When connected to the PC, it works just like an external USB 2.0 hard drive. Simply drag-and-drop all your media content from your PC to the device, connect it to your plasma or LCD TV and enjoy all the media in your living room! The standard composite and component cables give you plenty of good options to network your various entertainment center devices. Now, you can carry your movie library with you in small pack the size of a book! This s a highly portable, on-demand, personal video center - the perfect companion for travel, vacations and long-drive with kids. 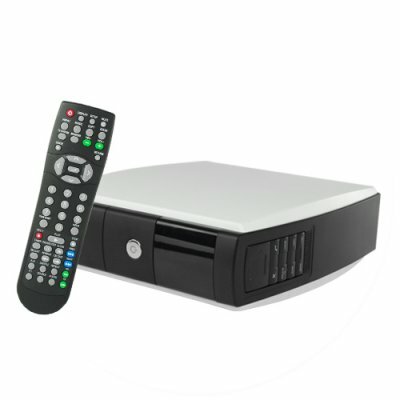 Its excellent design allows you to swap and upgrade its storage capacity in a matter of minutes, providing you easy and effortless access to many hours of multimedia entertainment.